In the early 1990s this corridor would have been filled with shoppers. 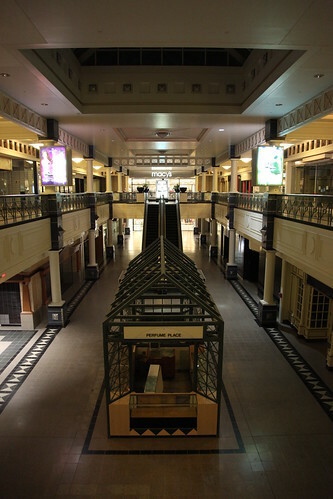 All the shoppers are now a few miles down the road at the soulless Palisades Center. Perfume Place always caught my eye because, as long as I've been alive, they had the same desktop computer running their point-of-sale system. Even in this shot, although it is not visible, the same old PC was just sitting there. It was definitely already obsolete by the time Windows 3.1 came out. I distinctly remember the "turbo" button on the case - which likely brought this PC up to a whopping 33 Mhz, up from a crawling 25!